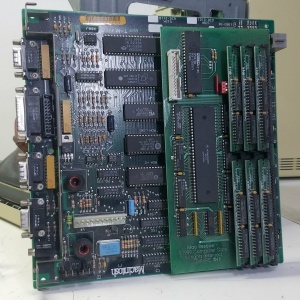 The MacRescue upgrade board apparently clips on to the existing logic board on a Macintosh 128K or Macintosh 512K to provide extra RAM capacity and a SCSI interface. In at least one example, a ribbon cable ran from the upgrade board to a 25-pin port on the rear of the unit. The unit in the pictures indicates this was manufactured in 1989 by Computer Care.